Two days circle level literary competition began on Monday with Drawing, Poster making , Essays writing and Extempore Speech. The 4th annual circle level literary competition began on Monday with Drawing, Poster making , Essays writting and Extempore Speech. Bhalukpong Hope clinic Medical Officer Dr Jumsang Sidisow graced the occasion as Chief Guest in the Opening day. 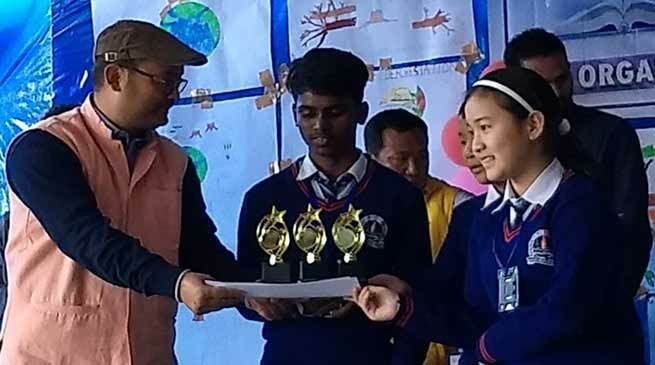 DFO Bhalukpong VK Jawal while attending the valedictory function give away Prize to the winners of various literary competition and encouraged and motivated the upcoming youths and students. EAC Bhalukpong Tamo Riba inform that It is an annual event and the Literary Competition is being conducted to motivate the students which encourage them to have their keen interest in all literary activities which include painting, poster making, drawing, quiz, debate, extempore speech, comic, poem recitation. The event was organised by the local administration of Bhalukpong and sponsored by local MLA Kumsi Sidisow and well-wisher and supported by NEEPCO Kimi, Platinum and MTM Distilleries Tippi and others. All pvt And Govt schools in the Sub Division participate this year. 4 Govt and 6 pvt schools take part in two day event. In drawing and colouring the Navajyoti English School of Bhalukpong become over all championship who win in Drawing and colouring, Essay Junior, Essay Senior, Extempore speech, debate, science seminar, quiz competition. Government Secondary School won in poster making and painting, while rest competition won by other schools. Tenzin Kungsang Khum of Navajyoti English School won the best literary award.